The stakes have never been higher in ranching. Or should I say steaks? Can you beat your neighbors to wrangle up the choicest livestock from the auction yards? Diversify between horses, cows, pigs, sheep, and roosters. Old McDonald ain’t got nothing on you. Just remember that the biggest deals may swing upon what you have up your sleeve! 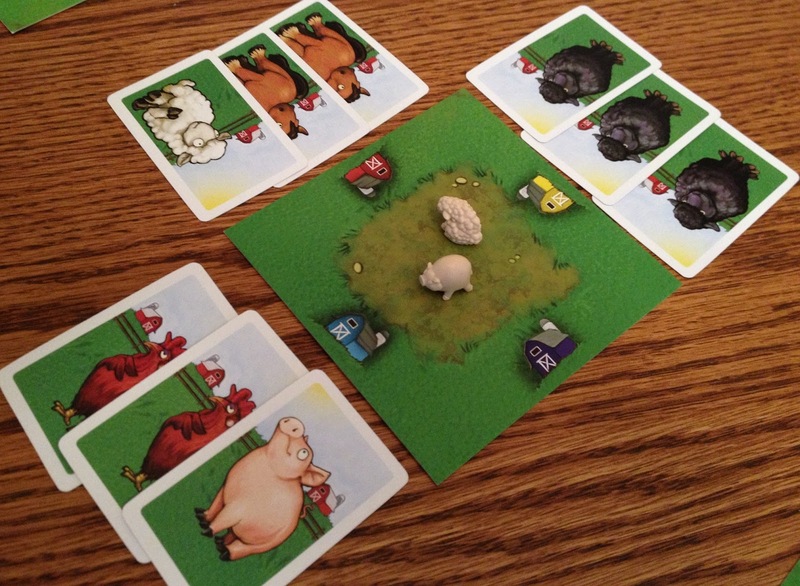 Black Sheep is a poker-style game resembling sort of a beefed-up version of five card stud. 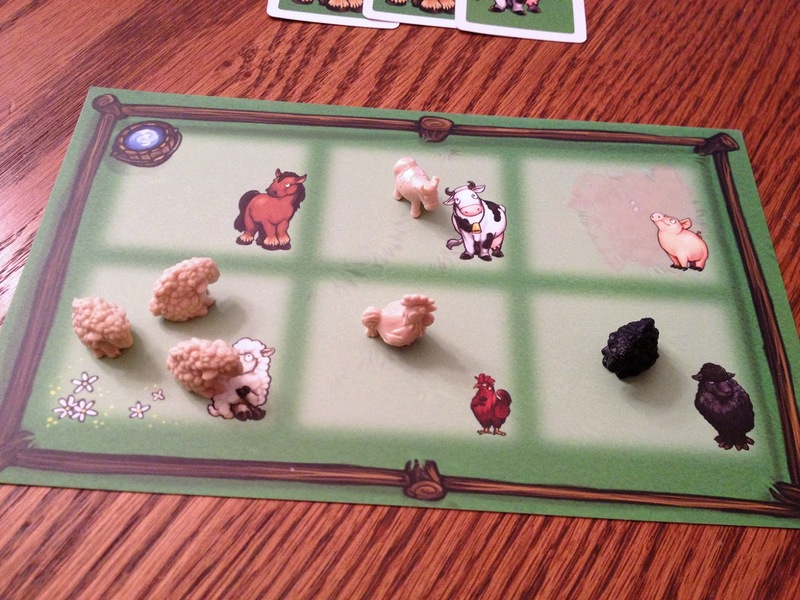 To begin play, you populate three fields in the middle of the table with two random animals apiece – horses, cows, pigs, sheep, roosters, or black sheep. Then deal players three cards from the deck, which will correspond to the various types of livestock. Cards do not depict any numbers, just animals. The goal of the game is to win pairs of animals by playing traditional poker-style “hands” of five cards to the fields. The trick is that you only play three cards to each pasture, using the two animals already there to round out your hand. Just as in poker, you’re trying to play hands that beat those of your opponents – 5-of-a-kind beats 4-of-a-kind which beats a Full House, 3-of-a-kind, two pair, pair, and high card. There are no straights. Instead of numbers, high-low is ranked by animal type from horse on down to black sheep so that, for example, a pair of horses beats a pair of cows. Five-card stud in three hands to claims the studs. On your turn, you must play one or two cards face-up to your side of a field. If you have not previously played to a particular field, then you can play either one or two cards there. If you’ve already played one card there, then you must play two. And if two are present, well then, playing one card is your only option. If you only played one card, you can discard another from your hand. Then draw back to three cards. Finally, check to see if any field is scored. A field is scored when all players have played their three cards to it. Then everyone compares their hands. Whoever scores the highest hand between his/her cards and the two animals in the pasture wins, takes the two animals and places them in his/her personal corral. All cards are then cleared and two new beasts are randomly added to the meadow. Play continues until all of the animals have been claimed. Players calculate their scores according to the numbers printed on the bottom of each captured livestock mini – which are unknown during play. Six point bonuses are also awarded to those players with majorities in each type of animal. You also earn bonuses for collecting sets of one of each breed – the more sets you have, the more points you earn. There’s an advanced variant included in which you have to fulfill secret task cards, scoring points for meeting specific requirements. I’ve never been a fan of poker. It’s not much of a card game – more about bluffing and reading others than it is about savvy play. If I wanted psychological analysis, I’d go on Dr. Phil. Speaking of which, how people can stand to actually watch others play poker on TV is beyond me. Oh, well. While still a game of chance, however, Black Sheep takes poker’s basic structure and at least allows some opportunity for smart play. Scoring the field: top right 3-of-a-kind beats two pair even though the other two hands were able to use animals in the pasture. Playing what essentially amounts to three different hands at a time offers a fun twist on the showdown mechanic. You can spread your cards out to try and maximize sets. If you can’t draw what you need in order to complete a field with a nice hand, you can delay a little by moseying on over to another, hoping to draw better cards for later. There’s an element of bluffing and push-your-luck in the manner which you play your cards, as well. Do you play just one card to a field, knowing you’re now stuck with needing a good pair to round it out next time? Or do you show your strength right off by dropping down two good ones? Randomness and luck of the draw will still ride herd in Black Sheep, though. If you simply cannot deal with a high degree of chance, then you should probably avoid this title. First of all, you can only play what you’re dealt. Despite efforts to distribute cards patiently among the three pastures while fishing for good matches, invariably you’ll get stuck with less than desirable options. Second, and probably more problematic for some, regular scoring is completely random as you have no idea which animals are worth what. Granted, there’s not a huge gap in values since all animals are worth either one or two points. But in close games, grabbing an extra two point critter or two can often mean the difference between first and second place. Example of the scoring variant cards. That’s where the bonuses and/or variant scoring options help. In the base game, you’ll try to target certain fields so as to acquire complete sets of livestock and/or a majority in one or more of the specific types. While luck of the draw can either aid or hinder you in that regard, playing smart will increase your odds. It’s certainly worth the effort as the points are not insignificant. The task cards give you a fun and challenging target to acquire, usually in the form of a specific combination of animals or more of one breed than others, etc. This is not nearly as easy as it sounds. In fact, now you’re at the mercy of yet another random factor – the order and manner in which the animals appear in the fields. The components help to make Black Sheep appear more than just a card game, when in fact, it’s just a card game. 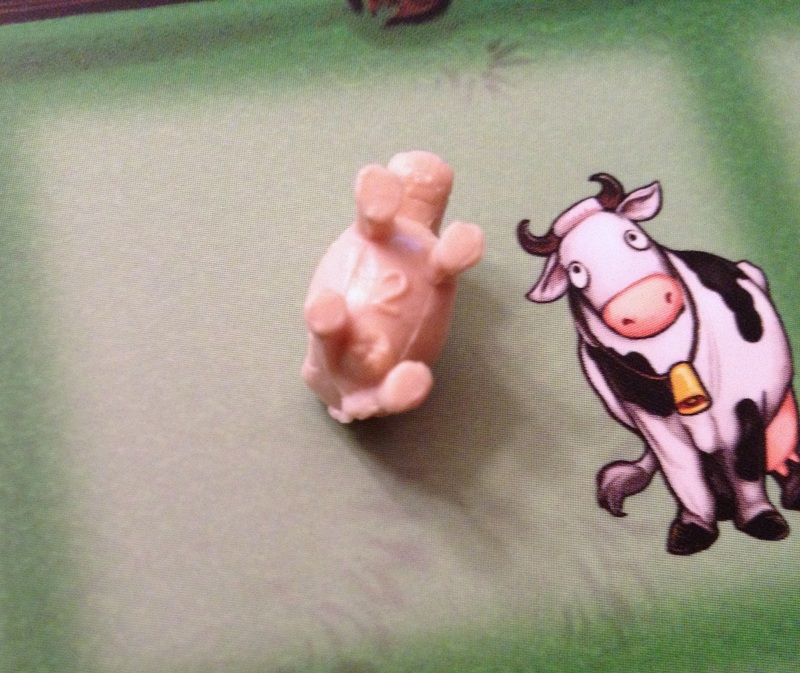 The animal minis are small, but cute, fun to handle and corral on your little board, and will catch eyes, especially those of kids. Younger kids will struggle with remembering the order of hand strengths, but there is a handy reference card for older kids and adults. Parents should enjoy playing with kids. As well, both casual and serious gamers who enjoy poker would probably like it as a filler. Yes, randomness is high, but it moves fast and finishes quickly enough that it’s satisfying for the time invested, knowing what type of game it’s meant to be. Yes, you have to tip the cows to see what you score! 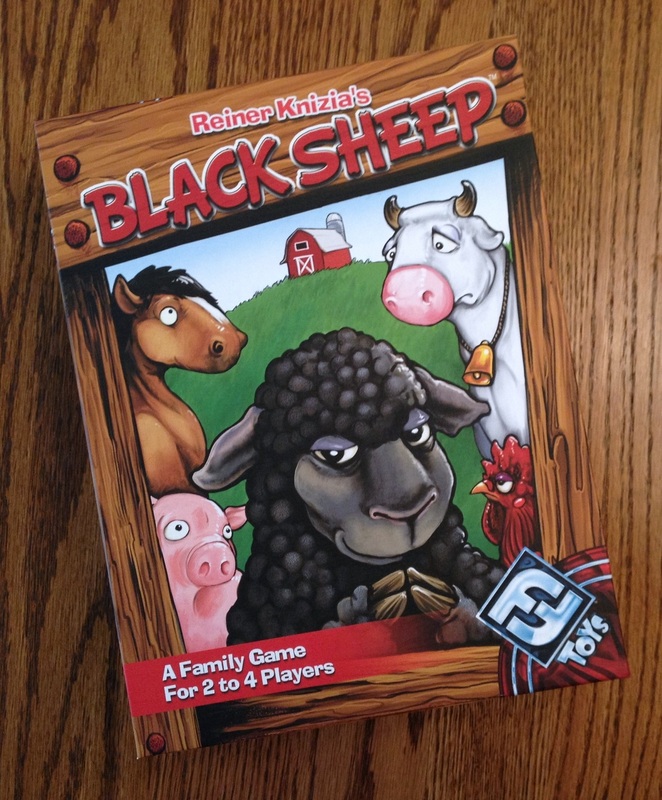 Black Sheep is an accessible title thanks to its familiar mechanics that works best as an older kids’ game. However, it might just fit in with your gaming group as a filler. Younger kids under 7-8 years will be attracted by its theme and cute and cuddly components, but will suffer a longer learning curve. In either event, this livestock wrangling title serves up a winning hand of family fun with quick play, frantic chance, and a does of good decision-making.